The origins of the Roadmaster name date to 1936 when Buick added names to its entire model lineup to celebrate the engineering improvements and design advancements over their 1935 models. Buick's Series 40 was named the Special, the Series 50 became the Super, the Series 60 was named the Century and the Series 90 — Buick's largest and most luxurious vehicle — was named the Limited. The Series 50 was retired, but new for the model year was the Series 80 Roadmaster. The implications of the name were clear, for as the 1936 Buick sales catalogue said, "It literally named itself the first time a test model leveled out on the open highway." The Roadmaster was introduced in a year when Buick's valve-in-head straight-eight engines were heavily revised. Buick reduced the number of engines from four sizes to two: a 233-cubic-inch, 93-horsepower job for the Special, and a big, 320.2-cubic inch, 120-horsepower engine for the other series. (To put the size and power of Buick’s larger straight-eight engine in context, compare it to the new 322-cubic-inch mono-block 120 horsepower V-8 that Cadillac introduced that year.) In addition to this major engineering change 1936 was also the year Buick adopted an all steel turret top and hydraulic brakes. Coil springs were in the front. The Roadmaster was a big car, in sedan form tipping the scales at 4,098 pounds, some 88 pounds heavier than Cadillac's new Series 60. But pricewise, the Roadmaster was a tremendous bargain. The sedan sold for $1,255, $440 less than the least expensive Cadillac. 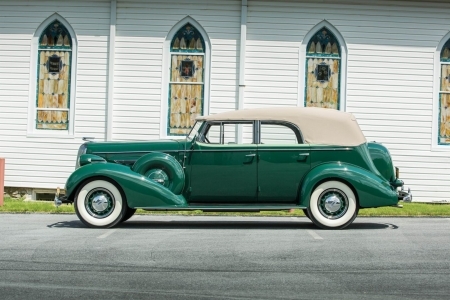 The only other body style available was a four-door convertible phaeton, priced at $1,565 (of which only 1064 were produced), at a time when a Cadillac in the same body style sold at prices ranging from $2,745 to $7,850. Buick’s new engineering and styling was a big hit, with model year sales more than tripling from just over 48,000 to nearly 158,000, and with the all new Series 80 Roadmaster contributing a total of 16,049 units to that number. Marco_Ghostly Uploaded by Marco_Ghostly on Aug 13, 2017 . 1936 Buick Roadmaster Convertible Phaeton - Desktop Nexus Cars Download free wallpapers and background images: 1936 Buick Roadmaster Convertible Phaeton. Desktop Nexus Cars background ID 2292427. The origins of the Roadmaster name date to 1936 when Buick added names to its entire model lineup to celebrate the engineering improvements and design advancements over their 1935 models. Buick's Series 40 was named the Special, the Series 50 became the Super, the Series 60 was named the Century and the Series 90 — Buick's largest and most luxurious vehicle — was named the Limited. The Series 50 was retired, but new for the model year was the Series 80 Roadmaster. The implications of the name were clear, for as the 1936 Buick sales catalogue said, "It literally named itself the first time a test model leveled out on the open highway."